Country legend Dolly Parton has sold more than 100 million CDs and created a business empire worth more than $200 million. But she's nowhere near finished. She's up for female vocalist of the year at the CMA Awards and will perform with Norah Jones at the piano. The Early Show co-anchor Hannah Storm saw them rehearsing for Wednesday night's awards and she reports jaws were dropping. Two of the most unique beautiful voices in music gave a powerful performance of Parton's classic, "The Grass Is Blue." "I think I'm more excited than anybody else," Parton tells Storm about her performance with Jones. "We had a chance to rehearse the last day or two a little bit. She's a great singer, a great gal." The song comes from "Just Because I'm A Woman" - a tribute album of women who recorded songs Parton has written through the years, Parton says. "Norah liked the song 'The Grass Is Blue,' which is the title of a song I did three or four years ago and of all the songs she had heard of mine, that's the one she picked and she did her own Norah Jones version and I'm going to sing harmony with her and start it out with my own blue grass thing and she takes it over and does her thing. It's going to be fun, I think," she says of what fans should expect. Parton has been one of Jones' idols. 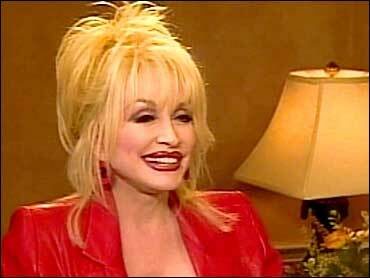 "I don't know how long she's followed me," Parton says with a big smile. "She's very young. I know she came to a concert. I was overseas last year. We were over in Ireland and she came and hung out with me and she told me she really liked my songs, which made me feel really good." Over the years, Parton has written over 3,000 songs. The number seems incredible but not to Parton. "I've been writing since I was a little child and they're not all good, though. I've got about three or four good ones." She adds, "That's my therapy. They're not all good and they're not all even complete, but it's like I write something all of the time." In her house, she says, she has her songs in boxes, trunks and dresser drawers. She says, "Everywhere, there are songs. That's natural for me. I get up in the mornings early and cook and have a notepad. Thoughts come to me so I write. I get creative in the kitchen so the better my food tastes, the better my songs are," and she laughs. Parton is nominated for Female Vocalist of the Year. It's an award she hasn't won since the bicentennial in 1976 and she is thrilled to be nominated again. The last time she was nominated was 16 years ago. Parton says, "It's been a long time that I've even had hit records on country radio. I've been doing a lot of traditional things, Americana music and bluegrass stuff but in a smaller market. And loving doing it, but I haven't really been in the mainstream so I was just knocked over when they said I was nominated for female vocalist. I thought after all these years, that is a great, great compliment. I don't expect I'll win..."
Parton says, "I would be grateful if I did, but I'm not expecting to. We got great people in there and it's been a long time and I'm happy to be out there running. When they asked me what I thought about it, I said, 'hey, I'm glad to be getting off the porch much less be running with the big dogs.'" The other nominees are: Terri Clark, Alison Krauss, Patty Loveless and Martina McBride. That does not mean she is at all nervous about what the night might bring; she says what she does get is excited. She says, "I still get butterflies, but I don't get scared because you get that feeling and you'd be crazy not to because I love it that much. Can't wait to at any time get out there. I'm like a racehorse in my stall. It's over the gates and let me go! As soon as the light hits, any kind of nervousness goes away." Expect to see Dolly Parton next week as well. She will perform live on The Early Show. In the meantime, you can catch her on the CMA Awards, starting at 8 p.m./ET, 7 p.m. Central on CBS.